In the fourth pAsuram, AzhwAr mercifully explains how emperumAn is having nithya (eternal) and anithya (transient) entities as his wealth. uLLap pal yOgu seydhi ivai enna upAyangaLE! Oh krishNa who is having divine eyes which appear like fresh lotus flowers which sprout honey! you should mercifully tell me one thing; you are having innumerable eternal and transient entities which have differences, as your prakAra; you are contemplating many types of thoughts in your divine heart for the protection of such entities, while fitting well on the mattress called thiruvananthAzhwAn who is spitting out poison, in the fully, spacious milk ocean; what means are you contemplating! I am not sure about what is going on in your divine heart. Are you thinking to incarnate? Are you thinking about how to eliminate the hurdles? Are you thinking about how to fulfil the desires [of such entities]? Are you thinking about uniting with your devotees? Are you thinking to become victorious? You should firmly and mercifully explain which is the one that you are thinking about. kaL avizh … – Oh one who is having divine eyes which resemble freshly blossomed lotus flower and who is obedient! emperumAn‘s wealth is attractive to AzhwAr just as his divine eyes. Alternative explanation – just as his divine eyes is hurting AzhwAr, experiencing his wealth too is causing hurt. What is causing hurt here? When one has a doubt due to lack of clarity on a particular subject, one will be distressed, and that would cause hurt. piLLAn explains “AzhwAr is reminiscing what he said in previous decad ‘sUzhavum thAmarai nAL malar pOl vandhu thOnRum‘ (They came and appeared like fresh lotus flower which is surrounding everywhere)”. Hearing this nanjIyar mercifully said “it will be nice if this too is similar to the experience AzhwAr had previously; but this being in a different taste, as the context here is AzhwAr being awakened from his previous bewilderment, that principle will not fit here”. uLLadhum … – Being the controller for the innumerable AthmAs (souls) which are said as existing [sath] and the variegated achith (matter) which are said as non-existing [asath]. As said in SrIvishNu purANam 2.13.96 “yaththu kAlAntharENApi nAnya samgyAm upaithi vai | pariNAmAdhi sambhUthAm thath vasthu nrupathachcha kim ||” (Oh king! That which has no changes such as growth or shrinkage, is called vasthu; you analyse about that), since achith is transitory it can be said as non-existing; and since AthmA is always singular in form, it is said as existing. 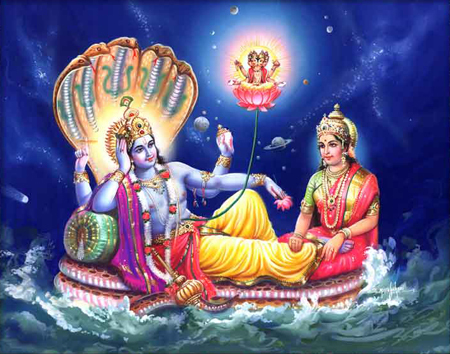 veLLath thadam kadal uL … – In milk ocean, fitting well on thiruvananthAzhwAn who is spitting poison to stop unfavourable ones from getting close. AdhiSEsha would have his fear placed in inappropriate place [where there is no reason for fear] and spit poison as said in nAnmugan thiruvandhAdhi 10 “AngAravaram adhu kEttu azhal umizhum – pUngAr aravaNaiyAn” (emperumAn has the furious AdhiSEshan as his mattress, who is spitting fire on hearing the praises of brahmA et al during thrivikrama avathAram, mistaking it to be an army of attackers). uLLap pal yOgu seydhi – You are having many thoughts in your divine mind for our protection. Just as there are so many different chEthanas (AthmAs), his thoughts are also so variegated and vast. How is this fitting with the preceding and succeeding sections [this is related to emperumAn being upAyam, while rest of the pAsuram, decad is focussed on AzhwAr enjoying emperumAn’s wealth]? achith, being transitory, should be given up; AthmA [chith], being singular in nature, should be pursued; ISvara would be the controller for both achith and chith; such emperumAn thinks “This chEthana has karma which he performs and has his own desires; unless he develops desire to reach me, he will not have the means to reach me; as he does not have that, what shall be done” and is resting there, thinking about the means to uplift him thinking “what shall we do to make him reach me, while he does not have the desire and does not say as in thiruviruththam 1 ‘inninRa nIrmai ini yAm uRAmai’ (I cannot bear this lowly life)” as if he said that. ivai enna upAyangaLE – As the chEthanas are many, their protection will also be in many forms; and since emperumAn is sarvagya (omniscient) he will know all such means; what [amazing] means are these! This entry was posted in thiruvAimozhi, thiruvAimozhi 7th centum on October 22, 2018 by Sarathy Thothathri.